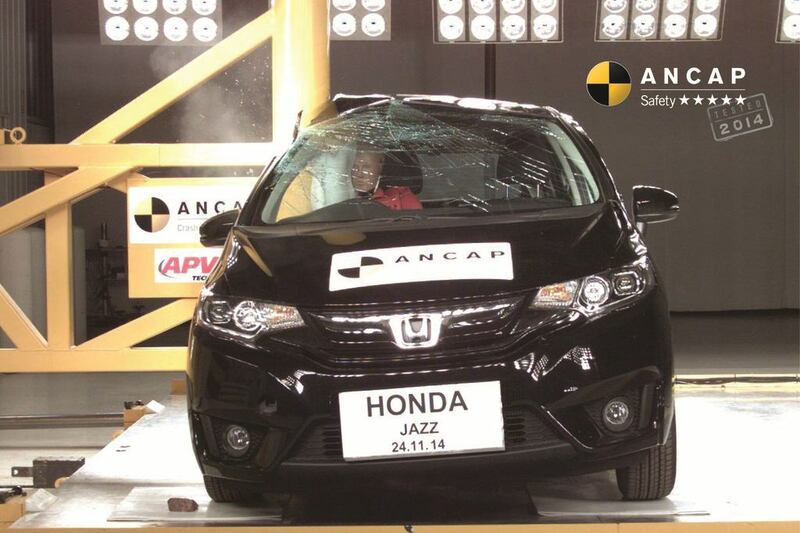 The New Honda Jazz, is something of a surprise to me. I haven’t ever driven a Honda and felt completely inspired, even having the chance to drive a few modified Type R`s, they just seemed to never get me feeling anything. That sense of apathy, isn’t helped with the typical Honda Jazz driver who in my neighbourhood of Killarney, is normally over 65 years old on her way to Pick n Pay for 2 tomatoes and an onion in a pulley trolley bag. Even with that stereotype lurking everywhere, I still find many families using this car, including my own. My folks have now had 1 very old Ballade, Jazz and lately the CRV. All of them equally great cars, with the CRV being the best so far, with loads more loading space and bulletproof reliability that Honda has become synonymous with over the past few years. 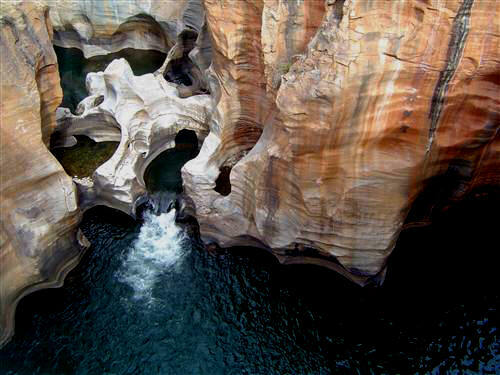 I drove the old shape Jazz last year, during one of our family trips to Mac Mac Pools in Mpumalanga. 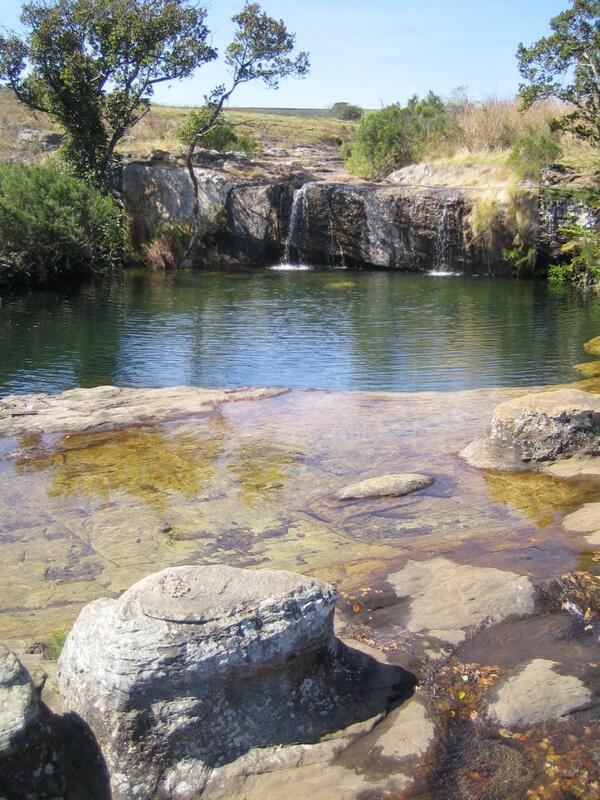 Every time that we visit my folks, we head there and to Sabie for a day trip. There are some really amazing views at Gods Window and Pilgrims Rest, and thanks to the focus on tourism from the Mpumalanga government, the road quality is great leading into Sabie – all the way from Nelspruit inwards. I got a good feel on that last family trip, for the stability of the old shape Jazz, its road handling and our overall comfort in the car. The amazing thing for me, was how big the front window is on that car. 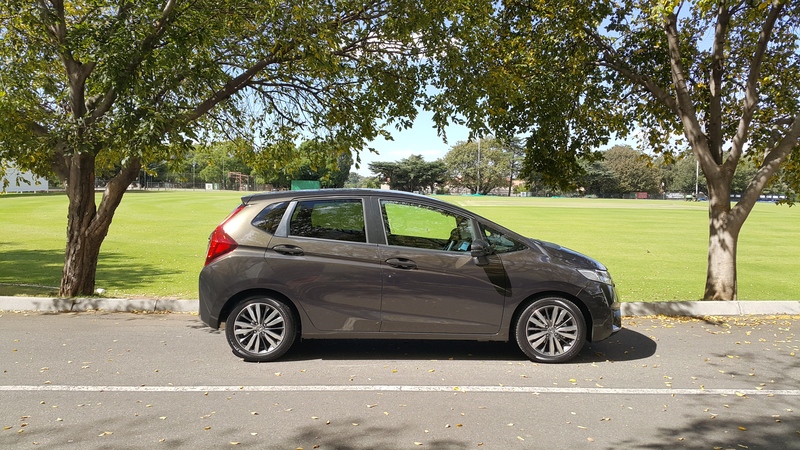 Even with the new shape Jazz (2015) 1.5 Dynamic, I was amazed at how good the visibility is, and how easy the car was to drive. The new design compared to the old one, is shaped in a more muscular/toned way. It`s like the Jazz has gone to Cross-Fit, switched to the Banting Diet and shared its rear tail lights with the new CRV. The shape from the back, looks a little SUV like, which in this SUV mad country, is not a bad thing. Somehow they have managed to drop the weight in this car, increased leg room by 8 cm, and still kept the overall length nearly the same as the old car. The interior design is what I liked most of the car. 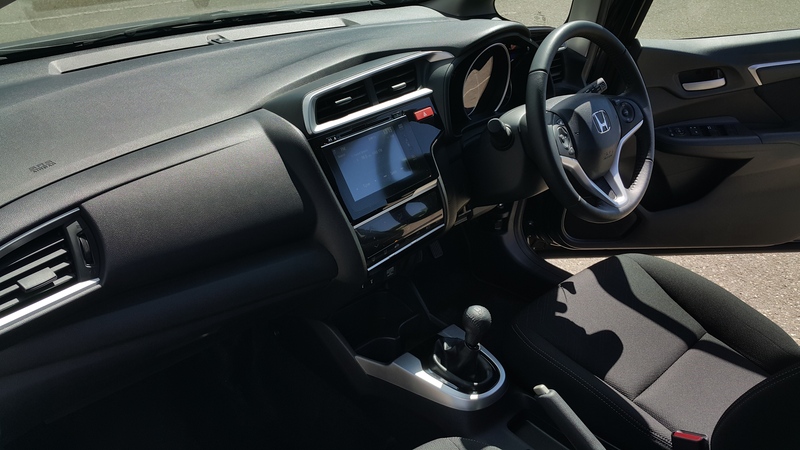 Honda have also opted for the piano black interior finish, put in their now standard Digital Display, which looks like Ipad Mini and has some digital buttons to increase volume and change settings through a touchscreen menu. It comes with Bluetooth, HDMI port, 2 USB inputs and also a 12 V charging point. Anyone that needs this car to cart around teens, will really appreciate all the places for them to charge up their digital devices. This includes any sales people, who have a Garmin GPS and cell phone plugged in at that same time to charge – much better than most cars. We had just come back from a family trip to the Drakensberg, so unfortunately I didn’t get to stretch the legs of the Jazz, however, if we needed to pack in 3 adult size bags in the boot, they would fit with more than enough room. 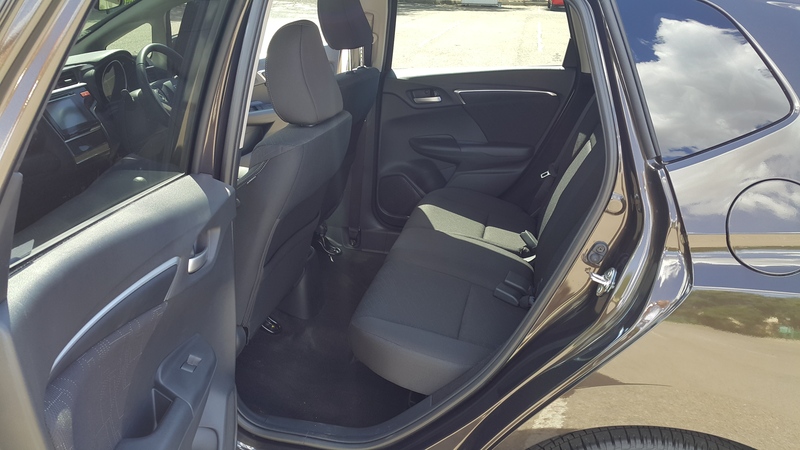 The rear legroom in this car is astonishing, and I take my cap off to the men and women in Japan and India would helped with the re-design of the interior. The seats are a bit scratchy, but should last long. There are 4 places to keep large water bottles, and we only felt that a centre armrest was missing a bit. The steering and instrument cluster – are both great, with the dials on the instrument cluster glowing blue and green, indicating times to change or not. The roomy space in the old car – feels the same in this one, just a little more focussed on design. Less granny and stodgy and more Fresh – buy this for your daughter kind of fresh. Showing the car to my two Student cousins – they loved the overall design and space. Enough room in the back seat for 4 small ladies, heading out to Hatfield on a Friday night as they do. I loved the design and space. The car has all the modern day requirements for a safe family car. 6 Airbags come standard on all models, so does Bluetooth. I only mention Bluetooth, because I have personally seen two really stupid accidents – with people taking off at a Yield Sign, while looking down at their phone, only to hit the bumper in front of them. We need to leave cell phones in the boot – and connect to Bluetooth. You don’t need to respond to every tweet, Facebook like and Email that comes through to your phone, while you drive. I know that life is hectic and business demands quick response to customers and calls, but you can`t respond if you are in an accident anyway. We have to lead the way for our kids, when using these devices. You set the tone for your family, every time you drive. More on safety – the doors lock as you drive away automatically, which is great for moms with kids heading to school or crèche. The car also comes with DSC and ABS, which is not standard on some cars being produced in India currently. Having as many as 6 airbags, Bluetooth, ABS and DSC needs to be the first few things you check for before buying a new car. Thereafter, you can look around for any indications online of Euro NCAP ratings (www.euroncap.com) and ratings on sales and trade in values – from TransUnion ( www.mytransunion.co.za – for credit reports and vehicle quick checks). Having stability control, controls the vehicle`s acceleration, especially when sharp turns are performed. Entering a corner in the wet it prevents the car from spinning when its load shifts from back to front and vice versa. This car handles like a dream, even with more spirited driving. It handled the corners on twisty bits with ease and never feels like it can lose control (all under 60 km/hr). 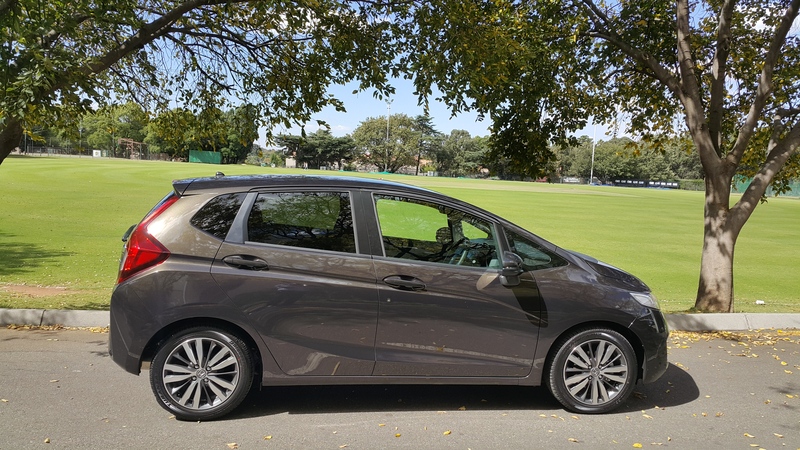 The car drove like a dream, and I was actually quite sad giving it back after a test week, to Honda West Rand, who kindly provided me with the Jazz. It was fun to drive! 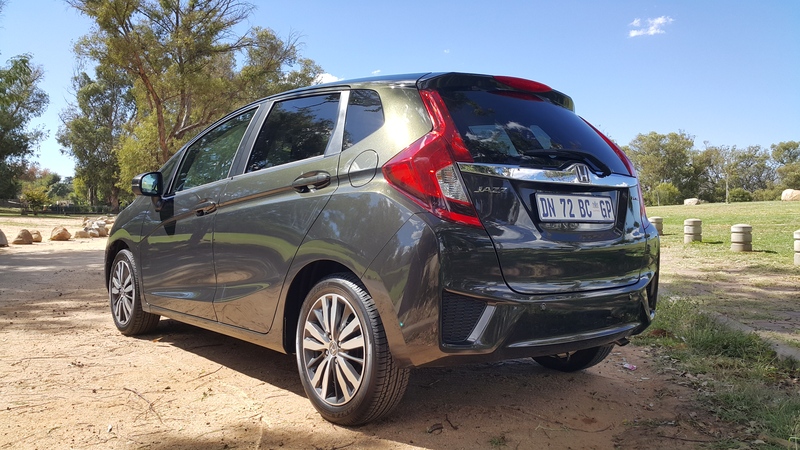 I haven’t thought that of most of Honda`s cars, but even cruising on the highway at 120, the car is very stable and the 16 inch Bridgestone tyres give you a great sense of security, even in a Highveld storm we went through during the week. The car can go faster, but it is most settled and confident in itself at 120 km`s/hr. The only area in my 400 km drive that I felt needed to be improved in this car, is the braking. For some reason (a brand new car mind you), the brakes at times didn’t feel sharp enough. It could just be this test car, so we will find out more and update in the near future. Working out how to use the speedo cruise, pairing my phone with the Bluetooth and playing my Itunes music off the Ipad, was pretty simple. The reason why they have an HDMI port – is so that you can see the actual phone interface on the screen in your Jazz. This is great for selecting the different aps you may need. It also allows you to download an APP to your iphone, which then can integrate to their maps interface, so you don’t need to pay R 24 000 for built in SatNav – the system simply communicates directions to you like Waze or Google Maps would. The technology part of this car, and interacting with it, is easy enough to manipulate even if you are not a tech fundi. Once again we dealt with Nujmah Samodien – who is now based at Honda West Rand. She was an absolute dream to deal with, as well as the New Car Sales Manager – Maxine. 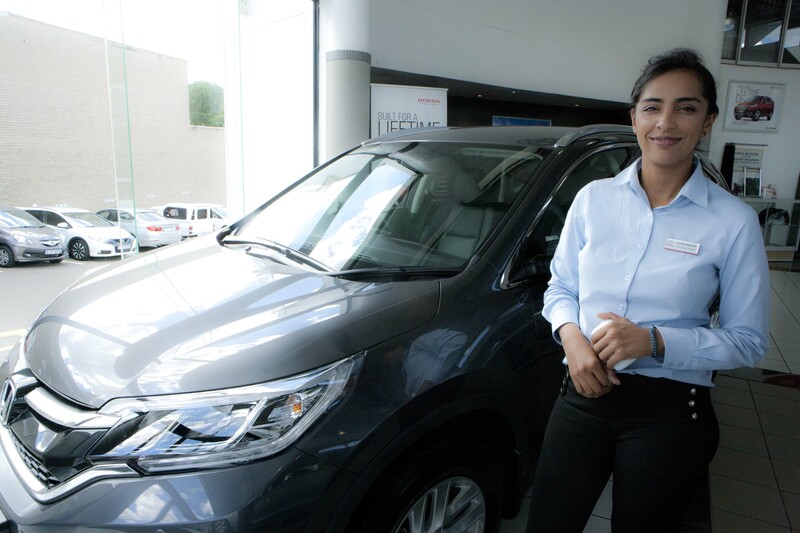 They both work together so well, that I can see Nujmah excelling in all she does at Honda. Often you get very good and warm service, especially at some of the smaller dealers – they offer both bikes and cars, and if you are free on a Saturday morning and don’t mind the drive – pop in to see Nujmah. In summary – this is a fantastic little car. I really loved it. It sells for R 257 300 (excludes on the road fees of R 4500.00) for the 1.5 L Manual model, but knowing what a fanatic I am about power, I would not choose any other model. 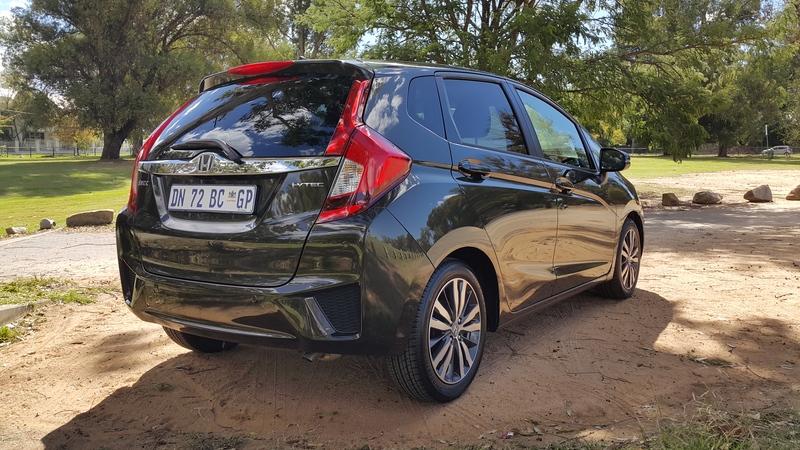 The 1.2 base however does start at R 179 000 – when you consider some alternatives from that price range, the Honda makes a great value proposition for first time buyers – families looking for a second car and even for the Single man or lady, looking for something as reliable as a Honda. 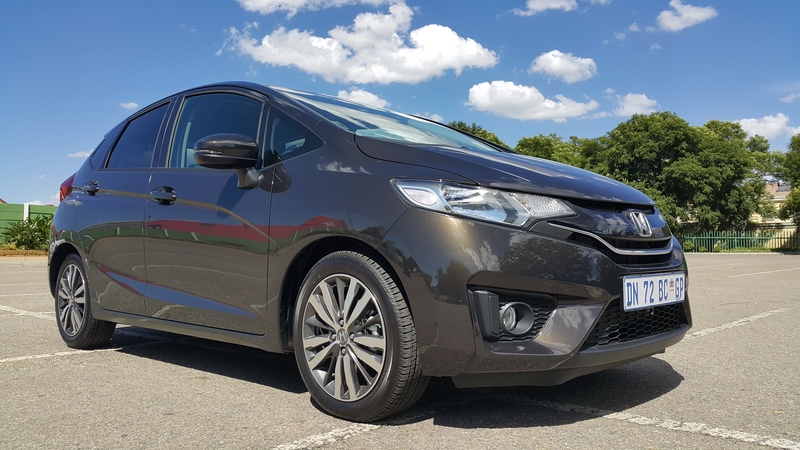 When Honda spoke about the Jazz at the launch, they were talking about 1st Time buyers as well, so if you have any Students leaving Varsity to start their first Job or Second – this would be a really great car for that application. If I had a daughter – we would probably buy this for her! This entry was posted in Car Review, Car Test, Honda. 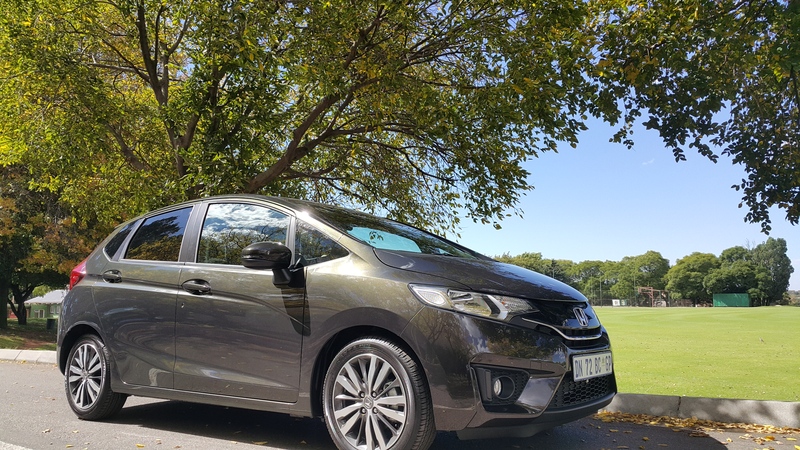 Tagged 6 Airbags Small Family Car, Car Review, Car Test, Cars.co.za, Hatch Back, Honda, Honda CRV, Honda Jazz, Honda Jazz Review South Africa, Honda Motors, Honda Review, Honda West Rand, Honda West Rangd, Honda.co.za, Jazz, Johannesburg, Mac Mac Pools, Mpumalanga, Nujmah SAmodien, Pilgrims Rest, Sabie, SABuyersguide.com, Small Car, South Africa, Test Drive, Travel South Africa, VW Up South Africa Review, West Rand. Next Post Next post: New Audi TT 2.0 TFSI – 169 KW PowerHouse!